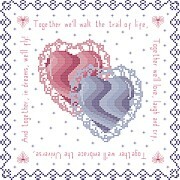 Celebrate love, respect and friendship with this square sampler. Two hearts joined in life surrounded by stars and the following saying: Together we'll walk the trail of life, Together we'll love, laugh and cry, Together we'll embrace the Universe, And together, in dreams, we'll fly! With Supplies: $19.38 You download the design. We will send you, 10 skeins of DMC Floss & Wichelt 14ct. 18" x 21" Aida (White) to complete your project.